Asia opened still with the buzz of Fridays surprizing good payrolls number. There were some concerns surrounding the sanctions the United Nations imposed on North Korea but these were quickly dismissed as the day wore-on. In Japan the Nikkei was not to sure in which direction to move and suffered a little ahead of lunch but the afternoon all was forgotten as the index gained +0.5% even as the yen remained with a 100 handle. One of the best in Asia was the Australian ASX which gained a little under 1% with gains seen from energies, financials, autos and miners. Shanghai and Hang Seng also added around +0.5% on a good broad performance even though the volume was light. SENSEX seems to have lost its glamour recently and even gave a little more back today (-0.2%. Europe certainly did not follow Asia euphoria for markets with prices only just remaining positive. Again, it was the DAX that was the maverick whilst other core’s held their heads. The DAX closed down -0.35% whilst the CAC, FTSE and IBEX all gained around +0.2%. Sadly, it was Deutsche Bank again one of the main concerns after its stock lost over 1% in todays trading. Talk of reports out that they are no-longer one of the top 15 private banks in the world. German Industrial Production fell for the first time this year, down 1.1% against expectations of +0.2%. Many attempted a positive spin but watch the numbers as they lighten their longs. Another telling point will be the spread between US and German Bunds after the currency takes a rest. In US trading we watched the DOW set yet another intraday record building more on last Fridays data. Following the report we have a set of interesting releases this week from Chinese Trade data, US Consumer Prices and a set of US treasury auctions to through in the mix. 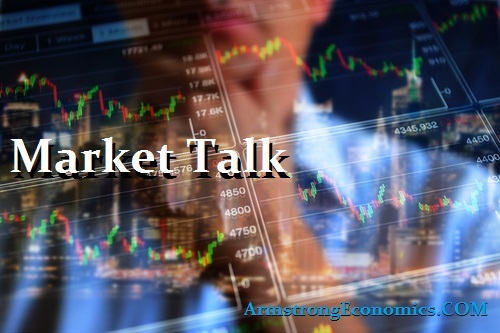 OPEC meeting headlines could through a nice curve ball later in the week but the way prices struggled as most stock indices rallied – it is doubtful we will here anything that will help oil prices. Gold losing ground late in the day as we watch yet more record closes for the DOW and S+P. 2’s closed 1.35% (u/c), 10’s 2.25% (-1bp), 30’s 2.83% (-1bp), Bunds 0.45% (-1bp) – spread unchanged at +180bp. France 0.73% (-1bp), Italy 1.98% (-2bp), Greece 5.36% (+1bp), Turkey 10.38% (-1bp), Portugal 2.79% (-1bp) and UK Gilts 1.13% (-4bp).